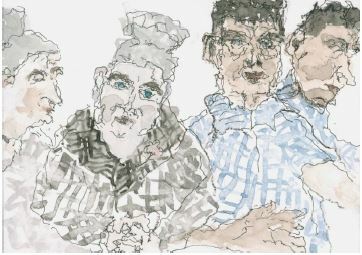 In the foyer of Tower Bridge Care Home on Tuesday 26 March at 2pm tea and cakes were had to launch an exhibition of drawings by the Tavistock Institute of Human Relations’ Artist in Residence Juliet Scott narrated with text by residents. A small group of invited guests were welcome to take part, watch or wander through an open plan movement and voice workshop with residents and Entelechy Arts’ artists. The illustrations by Juliet Scott were drawn for the monograph ‘On the Experience of Being 70 and Over’ written by her colleague Dr Mannie Sher following a Group Relations event for people aged 70 and over that he led at the Institute’s 70th anniversary festival. The illustrations came out of Juliet’s struggle in balancing her TIHR work with ageing and unwell parents. Featured in the drawings are the older people who Entelechy Arts work with and support in Tower Bridge Care Home; Entelechy’s art installation BED and some of Juliet’s close family members. BED was devised by older members of Entelechy Arts Theatre Group who wanted to make a statement about the invisibility they felt when going about their lives in public places. This exhibition is part of the continued partnership between the Tavistock Institute and Entelechy Arts which began when BED and Ambient Jam contributed to the festival.